Home Actress Advanced Screening Celebrity Moments Celebrity Video Coco Martin Gina Pareño grandma grandmother Juan Dela Cruz lola Lola Gets Premiere Night Rocky and Gina Pareño TV series Ms. Gina Pareño: From "Lola Gets" to "Lolaine!" 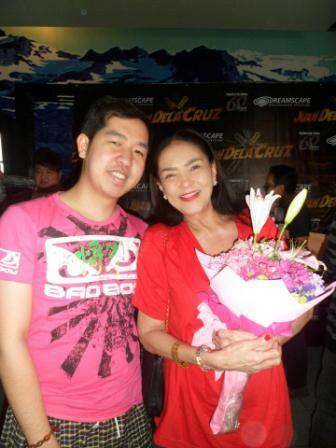 Finally, I met in person the very famous "Lola Gets," the award-winning veteran actress Ms. Gina Pareño! Ms. Gina is now playing "Lolaine," the grandmother of Coco Martin in the hit Primetime superhero TV series "Juan Dela Cruz." Actually, Ms. Gina reunited with Coco in the said teleserye. And this is now their third TV series together! They first worked together in the 2009 hit drama series "Tayong Dalawa" where Gina grabbed the title of "Lola Gets." Year after, they once more played the characters of grandma and grandson in another hit "Kung Tayo'y Magkakalayo." Now after three years, Coco and Ms. Gina reunited for this hit fantaserye. Ms. Gina is really an ideal lola! Though they were only "mag-lola" onscreen, Gina really treats Coco as her real apo! Me too, I like Ms. Gina to be my lola! My lola already died 14 years ago. And yes, I'm also close with my grandma!